At Wally’s, a bar that serves both Earthlings and aliens, Raphael is enjoying a drink when he notices the guy next to him looks familiar. He strikes up a conversation with him and it turns out the barfly is Cha Ocho, the Foot Soldier Leonardo scarred to “make a point”. Raph asks Cha if he’s still with the Foot Clan and Cha says yeah, but that he hasn’t been called into work for a while. Raph asks the bartender, Cookie, to bring them both a couple of boilermakers. Cookie steps into the backroom and is gone for a while, then returns with the drinks. As soon as Raph and Cha imbibe them, though, they pass out. “Cookie” then carries the two drunks, as well as the unconscious body of the real Cookie, to a trap door. “Cookie” turns out to be a robot using a holographic disguise. The robot then binds Raph and Cha and loads them onto a conveyer built, carrying them through a series of tunnels toward a spaceship. Raph and Cha come to, but only after they’ve been brought into the ship. They break their bonds and begin attacking the robots. Seeing the hatch closing, Raph jams it with a sai so they can escape. Unfortunately, the spaceship (which was disguised as an abandoned tenement down the street) has already begun takeoff. The two leap from the ship and manage to tumble down into a pile of trash. As they recover, they ponder whether the people and aliens that were kidnapped will be used for slave labor or food. Limping out of the garbage, they both agree they need a stiff drink after that caper. They decide not to go back to Wally’s, though. *As Cha Ocho says he hasn’t done any work for the Foot Clan in a while, this story likely takes place during the 6 month time gap in TMNT (Vol. 4) #5. *Leonardo scarred Cha Ocho’s face in Tales of the TMNT (Vol. 2) #6. Ocho will return in TMNT (Vol. 4) #6. *Raphael’s friendship with Cha Ocho will continue into the future, as seen in Tales of the TMNT (Vol. 2) #69. *This issue also featured a bonus story, “Channeling” by Fernando Pinto. This is a really short tale, not so much because of length (22 pages) but because it reads FAST. Rolston lays the pages out with large, “widescreen” panels that span the entire width of the page and you’ll rarely encounter more than four panels at a time. He and Murphy also make use of extended silences which, again, makes the reading experience fly by. That’s not necessarily a bad thing, though. I’ve complained about decompression before, in stories like “Donatello: The Brain Thief”, but the difference here is that this is a one-off scenario and not an extended narrative. And the “fly by the seat of your pants” story works well with the hasty panel work, as the pages whisk by. 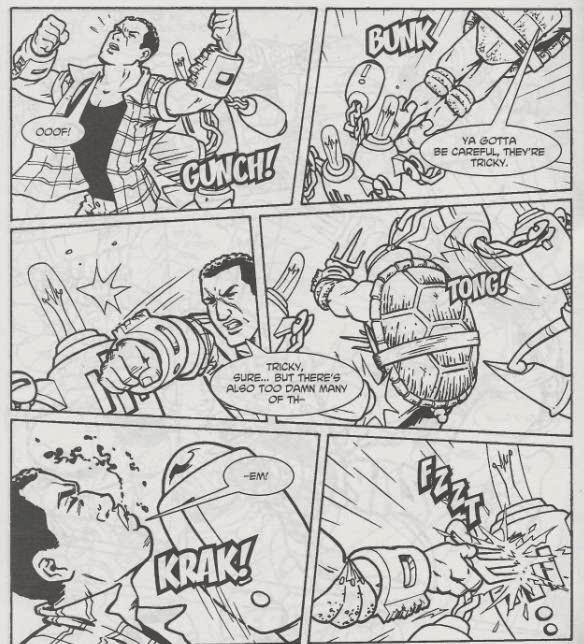 Yeah, it only took me 5 minutes to read, but I found this is one of those Tales of the TMNT issues I really remember. It’s something of a sequel to “Scars” in that, chronologically, this is our second glimpse of Cha Ocho. I wasn’t too kind in my appraisal of “Scars” and I had a bone to pick with Ocho. That bone, though, had more to do with the fact that he was so heavily built up and then nobody did anything with him afterward; he was all hype. “Shanghaied” is one of the few stories to actually try and follow through on the promises from “Scars” and it gives us a glimmer of the character Ocho could have been if the writers had felt compelled to develop him beyond an origin. The idea present here is that Ocho hates Leonardo… so naturally he and Raphael get along swimmingly. It’s an interesting exploration of both their characters, as neither seems to hold any animosity toward the other despite their allegiances. Ocho’s hatred of Leo doesn’t extend to Raph and likewise Raph doesn’t want to pummel Ocho just for being Foot. It’s a levelheaded look at the characters, who are both known for being impulsive and letting their anger get the better of them. And, again, it all winds up being an almost-completely discarded concept. 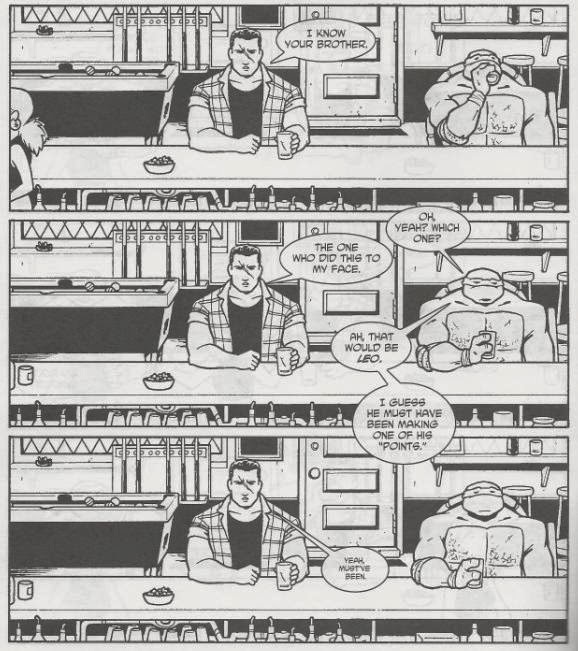 The idea that Leo and Ocho are bitter rivals but Raph and Ocho are drinking buddies never got utilized beyond this tale. “Dark Shadows” is the only story, I think, that ever references Raph and Ocho’s friendship again. The overall conflict, the robots harvesting Earthlings (and aliens visiting Earth), is neat because it’s one of those moments where the bad guys aren’t fleshed out or given motivations or defeated. Raph and Ocho stumble into their trap, escape by the skin of their teeth and just move on with their lives. They don’t play the heroes or anything like that. It’s very different from the usual stuff, making it rather light reading, but also unique. In terms of the chronology, I like to think this happens during the time gap early in Volume 4 (because of Ocho’s statement about his employment frequency). The idea that these people-harvesters immediately descend upon a new planet contacted by the Utroms shows how Earth attracts the best and worst of the alien cultures via First Contact. “Shanghaied” is a pretty good tale, if a very short and sweet one. It’s one of the few to try and live up to Cha Ocho’s hype and if we’d had more of these he might not have been such an embarrassment. 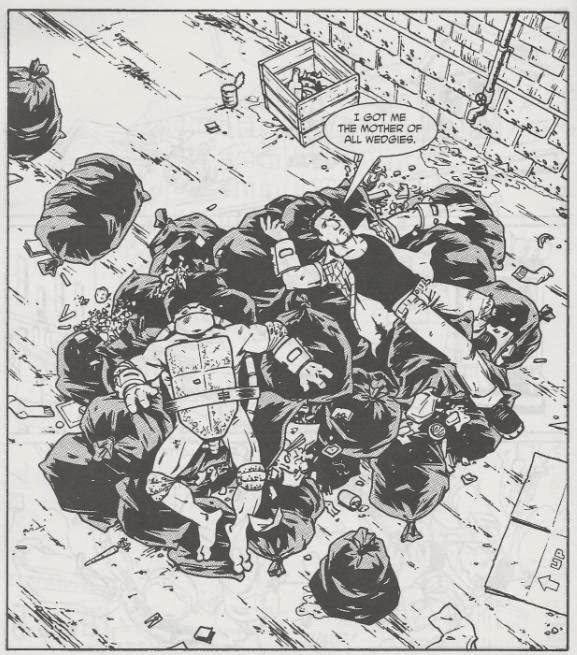 It definitely stands out in the Tales of the TMNT canon and is worth a look. yeah, that did surprise me. they both kinda shrugged and were like 'maybe they'll use the humans for slave labor, or food. wanna get a drink?' and went on with their lives. If that example doesn't showcase that the TMNT aren't heroes in the strict sense of the word, and are just 'people' living their lives, I don't know what will. "The idea that Leo and Ocho are bitter rivals but Raph and Leo are drinking buddies never got utilized beyond this tale. “Dark Shadows” is the only story, I think, that ever references Raph and Ocho’s friendship again." 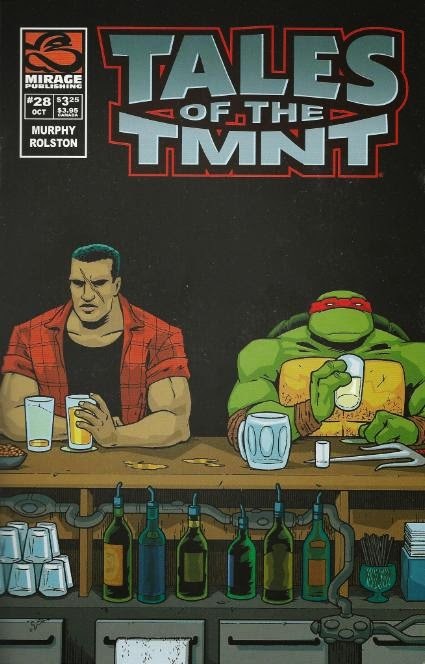 Should that first sentence read "but Raph and Ocho are drinking buddies" ? No review of Tales of TMNT vol.2 #27 ? Is there a reason ? I'm working my way through TMNT Vol. 4 right now, and the story in Tales #27 is embedded in the Vol. 4 storyline. So I figured I'd do that one in sequence.